Sally Ann’s are named for a packaged cookie available in the 50’s. There are a lot of recipes for them, I tried this one using lard, and they were like the ones we remembered. The recipe makes a large quantity, but my husband took some to his golf club and they went fast. The combination of the cookie and the frosting (kinda like making marshmallows) is what makes this cookie. The frosting hardens on the outside but is soft inside. Cookies will seem very hard when cooled; let them set, frosted, uncovered, overnight, and they will be soft and moist – just right! The hardened frosting makes them perfect to carry in a lunch box or for picnics. The traditional shape is cut with a Spam can (thank you Myrna). 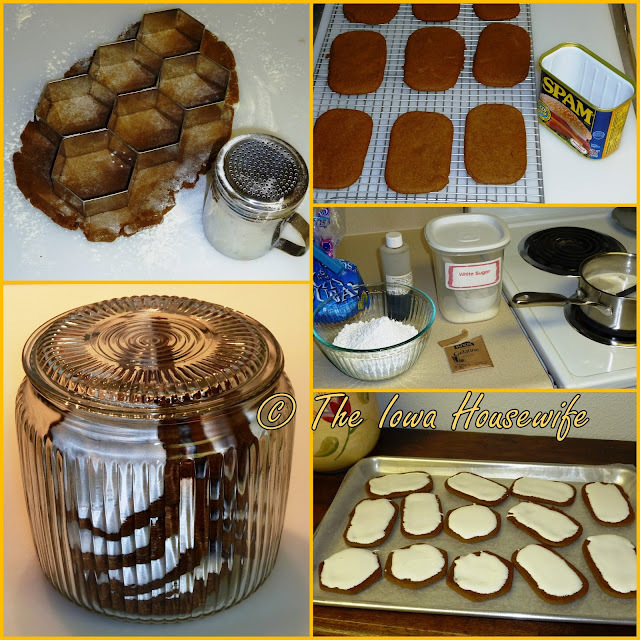 I also tried out my new “linked hexagon cutter” that I bought for biscuits. Both methods leave little waste when cutting. These freeze well even after frosting. I use parchment on my cookie sheets. Do not reuse hot baking sheets - let the sheets cool between batches. Butter cookies will spread more than lard cookies - keep them cold until you put them in the oven. There are no eggs in this dough, it is not a mistake. In large bowl, with mixer at low speed, beat sugar with lard or butter until blended. Increase speed to high; beat until creamy. At low speed, beat in flour and remaining ingredients except frosting until well blended. Cover bowl with plastic wrap and freeze 1 hour or chill 2 hours or so or until firm enough to handle. Preheat oven to 350 degrees F. Grease large cookie sheet or use parchment paper. Roll out dough 1/4" thick on lightly floured board and cut out with Spam can or 2 1/2" cutter. Bake 15 to 20 minutes, until set and lightly browned around the edges. Cool on cookie sheet 1 minute then, with pancake turner, remove to wire rack to cool completely. Repeat with remaining dough. When cookies are cool, prepare Sally Ann Frosting: In 2-quart saucepan, stir 1 cup sugar and the unflavored gelatin until well mixed. Stir in 1 cup cold water; heat to boiling over high heat. Reduce heat to low; simmer, uncovered, 10 minutes. Into at least a 2 quart bowl or your mixer bowl, measure confectioners' sugar and baking powder, if used. With mixer at low speed, gradually add gelatin mixture to confectioners' sugar until blended. Increase speed to high; beat until smooth and fluffy with an easy spreading consistency, about 15-20 minutes. Beat in vanilla extract. Keep bowl covered with plastic wrap to prevent frosting from drying out. With small metal spatula or knife, spread frosting on back side of cookies. Set cookies aside to allow frosting to dry completely, about 3 hours, or overnight, depending on the humidity. Cookies will seem very hard when cooled; let them set, frosted, uncovered, overnight, and they will be soft and moist – just right! 2010 cost: $4.10 or 10¢ per cookie using lard. $5.65 or 12¢ per cookie if using butter. Yield: "4 Dozen Large Cookies"
These were my favorite cookie as a child, because our Mom bought them for Dad's lunch pail and we were only allowed one as a treat. Any store bought cookies were a treat as we always had homemade. Wow, from your description of the cookie/frosting, I think these may well be the cookies I've searched for since caterers served them at my Uncle's farm/studio auction in South Dakota in 1989! They refused to give me the recipe tho I swore I lived in Michigan so no one there would know. They'd be perfect for taking along in your pack for hiking. That the caterers cut their cookies large & round seems to be the only difference. Thank you! I was just telling my friend about these cookies that we had as a kid back on the farm in Minnesota. Found your recipe, ahhh, the memories! I emailed her your link. Thank you! My sister and I have been discussing our annual bake a thon and she informed me that we HAVE to make Sally Ann cookies in memory of our Gramma Eigen. She just passed away a week ago. I couldn't find her recipe so I did a search and found yours. I do believe this is it! So again, THANK YOU! Same here, remember them as a kid in the 60's. They are just their own little special kind of goodness and people who have never had them don't know what they are missing. My mom made these every Christmas since the 1960s, and I lost the recipe. So glad to find it again thanks to you, and I'm going to make a batch today! We sure like this recipe...hope you do too. These cookies are called "Aunt Sally" cookies here in New England. My recipe is nearly identical to yours! I use half butter and half Crisco in mine. My cookies bake at 375 for exactly 11 minutes and the frosting requires 1 tsp of vanilla. That frosting takes forever to make, but it's sooooo good! My mother remembers these so vividly from her (Wisconsin) childhood! I sent her a box full for her birthday, and she shared them with all her girlfriends and they had a good time reminiscing and eating them. She says the frosting was sometimes pastel pink or pastel green. Of course anyone who tries them loves them! They are my daughter's favorite cookie to bake and we consider them our "signature" Christmas cookie. It's hard to believe a cookie this delicious vanished from store shelves and self-published community cookbooks. My mom has a large collection of locally-published (parish, school, women's organizations, etc.) cookbooks, and the Sally Anne (Aunt Sally) isn't in any of them! Unbelievable. Sue, I forgot to add that if you bake them at 375 for 11 minutes, the cookies rest on the pan for 2 minutes before removing them to a wire rack! I am new to your website and just love it! You and Myrna have created such a wonderful collection of recipes and stories and remembrances. Thanks for sharing your recipe tips. Glad you are enjoying the blog. And you're right, not too many young girls named Sue! This recipe doesn't call for any eggs. Is that a typo? There are no eggs in this dough, it is not a mistake. Yum yum! WHEN I was in college in Mn.we bought a pkg every weekend. It was fun to make them after all these years. Thanks. Glad you tried them and liked them as much as we do! These look and sound yummy! I love your clear glass cookie jar, where did you find it? These are delicious, just like the ones you used to be able to buy. The cookie jar is a vintage "biscuit" jar...I use it for cookies and crackers. You can still see them for sale online or in antique malls or thrift shops; mine was a gift. Would you know the history of them or the company the use to make them? I don't...and there is very little on the internet. Our dad loved them in his lunch pail and these and fig newton's were about the only purchased cookies we ever had.